What Are Infra red heaters? Infra red heaters use electromagnetic waves to heat another object using the invisible light spectrum. Infrared light is not visible to the naked eye. 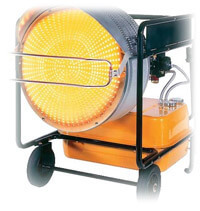 These heaters are the best known heating source for achieving maximum efficiency. They can heat an object by not transferring heat to the surrounding air, but to the object only. That means that the surrounding air remains at the same temperature as before. An infrared heaters usually use quartz, ceramic, metal and glass as the heating elements. The most commonly used heating element is quartz. Infra red heaters are mostly used for heating rooms and open spaces. Infra red heaters are claimed to be the most efficient heating source possible, with an efficiency rate of almost 100%. That means no heat is lost to the surrounding air. While traditional heaters work by heating the air in a whole room, an infra red heater uses infrared light to heat a particular area in which it is directed. An infrared heater is perfect for use in open spaces in extremely cold temperatures. In the winters when there is snow making your car cold, an infrared heater can help heat the car engine helping it to start up easily. It can also be used while working outside in the cold; it will keep the workers warm so that they can perform their tasks regularly. Just like power washers create heat and pressure in a regular garden hose to ease cleaning in open spaces even in the coldest temperatures, infra redheaters can help workers perform task outside in the cold without freezing due to the low outside temperatures. These are places where no other heaters will possibly work. Also, in the winters when there is less sunlight it becomes impossible to dry off adhesives or paint on recently applied surfaces, using an infrared heater makes the drying process extremely fast. An infrared heater runs on electricity or through use of fuels like kerosene or diesel. The actual casing of the heater is never that hot at any time. Therefore, there is no risk of getting your hand burned by accidentally touching the casing, which normally happens with a traditional heater. An electric infrared heater does not produce any byproducts that result from burning fuels. This is very similar to a pressure washer that uses electricity to create heat and pressure in the water hose. Even the heaters that run on fuel do not produce any smoke or odor. They come with excellent exhaust systems that release the resulting gases up into the open air. Infrared light gives off heat energy, which penetrates the surface of an object evenly. Therefore, heat is absorbed by the objects or people in the path of an infrared heater. Learn about Electric and Gas Infrared Heaters. Anti-icing methods, tailgate salt spreader and de-icers.